There’s no doubt about it: South Africans are a meat-eating nation. And what better meaty treat than anytime biltong! For some people it’s game and nothing but. Others prefer readily available beef biltong. And then there are the connoisseurs. Biltong makers themselves, who relish the art of preparation and the joy of anticipation almost as much as the finished product. The name biltong is synonymous with tradition. Over the years, biltong has become a legend in its own right and nowhere in the world is it found in exactly the same form as we know it here.The very first biltong was made by farmers and hunters in the hinterland –probably using game, not beef. They obviously made it for private use and the townspeople were lucky if they could sample a bit of biltong now and then. But as soon as the butchers started producing biltong, it spread like wildfire and today the commercial production of biltong is estimated at approximately one million kilograms per year. Biltong Terminology: The first appearance of the word biltong (from the Netherlands BIL: buttock and TONG: strip) has been traced back to 1815, although even the Oxford Dictionary now lists it as “strips of sun-dried meat” and the American version is Jerky. Choose the right cuts: The finest biltong is the “garingbiltong” cut from the eye muscles running down both sides of the backbone and which are cut whole from a side of beef. The most tender is the fillet. This is cut from the muscle inside the backbone. While the larger muscles are most suitable, virtually the entire carcass can be cut into biltong. The buttock consists of the silverside, thick flank and topside. Start cutting biltong on the silverside or outside, where the “seams” of at least two muscles are clearly visible. The round muscle yields what is known as the “ronde” or “predikantsbiltong”, and the rectangular muscle “regte biltong”. The meat must be of good quality. Lean cuts from a young carcass containing little fat, are best. And a last word of advice: choose your time as carefully as your meat – preferably ate autumn or winter when the weather is cold and dry and the fly population at a minimum. Extra Flavour: Although it is common practice to use only salt or salt and pepper, many biltong makers will tell you variety is the spice of life. Brown sugar added to the salt gives the biltong a softer texture whilst coriander (scorched, ground and sieved), is a popular choice for additional flavour, but never in such quantities that the flavour of the meat is over powered. If you want to “play it safe”, ready-mixed spices with full directions for use are obtainable from spice merchants. But with our easy reference table and tried and trusted method below, you cant go wrong. This is how: Always choose good quality meat from cuts such as thickflank, silverside or topside. Cut the meat along the grain into long strips, as thick or as thin as you wish. Pack the meat into a wooden, earthenware or plastic container. Sprinkle each layer of meat wit the salt mixture. Sprinkle with a little vinegar and leave overnight. The next day, dip n hot vinegar water to remove surface salt and hang the biltong in a cool, dry place. See that there is always a good draught where the biltong is hanging. Salting: The basic recipe for biltong is 200 – 400g coarse salt to every 10kg of meat. First cut the meat, then measure the total mass to calculate the quantity of salt required. The thinner the biltong, the less salt is required. And remember, biltong becomes more salty the longer it is left to dry. The meat can be placed in brine or it can be salted dry. Rub the salt or the salt and spice mixture into the meat by hand and pack the thick pieces at the bottom and the thinner strips on top. The longer it remains in the salt, the more salt is absorbed. Remember, fatty biltong takes longer to absorb salt than lean meat. In warm climates, 10g bicarbonate of soda per 10kg meat can be added to the salt mixture, to prevent mould setting in. Saltpetre as preservative will give the biltong a bright red colour. Drying: When the biltong is ready to be hung, draw short pieces of string through the ends or insert thin wire hooks. Some biltong makers believe in a sprinkling of pepper to keep the flies away while the meat is drying. Hang the strips well apart to sun-dry for the first day; then move them to the shade. Biltong can also be hung indoors, but make sure there is a good draught. An electric fan can be used improve air flow. 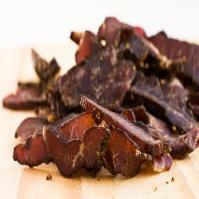 Storing: Beef biltong is at its best when the inside is soft, moist and red in colour with a harder brown outer layer. It is not always possible to keep biltong moist and then freezing is a good solution. Wrap the strips separately in cling-plastic and place in a plastic bag r air-tight plastic container in the freezer. If the biltong contains no fat, it can be frozen for approximately 18 months. Fatty biltong can be frozen for 9 months, after which the fat may go rancid. Slow: Place biltong with plastic wrapping overnight in fridge. Then leave outside for approximately 1 hour, after which the biltong will be ready for eating. Quick: Remove from the wrapping and microwave for approximately 1 minute on 30% power or on the defrost setting. Then leave outside for approximately 1 hour. Freeze in plastic bags or air-tight plastic containers. Use frozen biltong in dishes. For sandwiches or just for snacking – leave the biltong outside for a while before using. If the biltong is to cold, it will have very little taste. How to store dry biltong: Wrap the biltong in meat-cloth or make special bags from cheese-cloth or any material that can breathe. Store the biltong in these bags n a cool, dry place with good air circulation. It will keep for more than a year, provided the biltong contains no fat. The fat will become rancid with time, but the meat will keep and keep. Biltong bly darem die allerheerlikste vleis slekkerny onder die son! Vir sommige is dit wildsbiltong en niks anders nie. Vir ander bly lekker klam beesbiltong bobaas. En dan is daar die fynproewers. Die selfdoeners wat begin lippe aflek by die gedagte aan die maak, en dan daardie uiteindelike smaak! Die naam biltong is al sinoniem met tradisie.Oor die jare het biltong ‘n legende in eie reg geword en soos ons dit in hierdie land ken, kry mens dit nêrens anders in die wêreld in presies dieselfde vorm nie. Die heel eerste biltong is deur boere en jagters in die trekland gemaak – waarskynlik van wildsvleis, nie beesvleis nie. Hulle het dit natuurlik vir eie gebruik gemaak en die dorpsmense het net so af en toe ‘n bietjie biltong in die hande gekry. Biltongtaal: Die word biltong (van die Nederlands BIL bilstuk of boudstuk en TONG: strook of moot) is sovêr bekend vir die eerste keer in 1815 opgeteken, alhoewel selfs die Oxford woordeboek dit nou aangee as “strips of sun-dried meat”. Kies die regte snitte: Die heel lekkerste biltong is die “garingbiltong” uit die oogspiere wat weerskante van die rugstring afloop en heel uit ‘n bees-sy gesny word. Die sagste is die “binne biltong” of “ouma se biltong”. Dit word gesny uit die spier aan die binnekant van die rugstring, wat as ‘n kleinhandelsnit bekend staan as die filet. Hoewel die groter spiere die geskikste is, kan fetlik die hele karkas in biltong oopgesny word. Die boud bestaan uit die dy, diklies en binneboud. Begin biltong sny aan die dykant, dit wil sê die buitekant van die boud, waar die nate van veral twee spiere duidelik sigbaar is. Uit die ronde spier kry jy die sogenaamde “ronde” of “predikantsbiltong” en uit die reghoekige spier die “regte biltong”. Die vleis moet van goeie gehalte wees. Maar snitte van ‘n jong karkas wat min vet bevat, is die beste. En ‘n laaste stukkie raad: kies jou tyd net so versigtig as jou vleis – verkieslik na-herfs of winter, wanneer daar min gevaar van nat, warm weer of besoedeling van vlieë is. Ekstra Geur: Hoewel dit gebruiklik is om òf net sout òf sout en peper te gebruik, glo baie biltongmakers dat ‘n knippie verbeelding die lekker soveel lekkerder maak. Bruinsuiker by die sout help om die biltong sagter te maak terwyl koljander (geskroei, gemaal en gesif) ook ‘n gewilde smaakkeuse is, maar nooit soveel dat dit die geur van die vleis oorweldig nie. Vertrou jy jou eie oordeel nie so mooi nie, kan jy klaar vermengde speserye. Maar met ons maklike verwysingstabel en beproefde metode op die volgende bladsy is biltongmaak sommer kinderspeletjies. So maak mens: Kies altyd goeie gehalte vleis uit snitte soos die dy, diklies of binneboud.Sny die vleis met die draad langs in lang stroke, so dik of so dun soos jy verkies. Pak die vleis in lae in ‘n houtbalie, erdehouer of plastiekhouer. Sprinkel ‘n bietjie van die soutmengsel tussen elke laag. Besprinkel met ‘n bietjie asyn en laat oornag staan. Spoel die volgende dag af met warm asynwater om die oppervlaksout te verwyder en hang die biltong op ‘n koel, droë plek. Sorg dat daar altyd ‘n goeie trek is waar die biltong hang. Insouting: Die basiese resep vir biltong is 200 – 400 gram growwesout vir elke 10kg vleis. Sny eers die vleis op en bepaal dan die massa om die hoeveelheid sout te kan bereken. Hoe dunner die biltong, hoe minder sout is nodig. En hoe langer die biltong hang, hoe droër word dit en hoe meer sout proe dit. Die vleis kan in pekelwater lê of droog gesout word. Vryf die sout of sout- en speserymengsel met die hand oor die vleis in, pak die dik stukke onder en die dunner stroke bo-op. Hoe langer dit in die sout lê, hoe meer sout word opgeneem. Onthou, biltong met baie vet aan neem langer om sout te absorber as maer vleis. In warm streke kan 10 gram keoksoda per 10kg vleis by die growwesout gevoeg word om te verhoed dat die biltong muf. Salpeter as preserveermiddel sal aan die biltong ‘n helderrooi kleur gee. Droging: As die biltong reg is vir hang, trek kort stukkies tou deur die ente of gebruik dun draadhakies. Party biltongmakers glo vas dat ‘n strooiseltjie peper, net voor jy die vleis ophang, sal help om die vlieë weg te hou. Hang die biltonge die eerste dag in die son op en daarna in die koelte, weg van mekaar af. Biltong kan ook binnenshuis hang, maar dan moet daar ‘n goeie trek wees. ‘n Elektriese waaier help om die lugvloei te verbeter. Bewaring: Beesbiltong is op sy beste wanneer die binnekant sag, klam en rooi van kleur is met ‘n harder bruin lagie buite-om. Dis nie altyd moontlik om die biltong klam te hou nie, en dan is bevriesing ‘n goeie uitweg. Draai die biltong apart in kleefplastiek toe en plaas in ‘n plastieksak of lugdigte plastiekhouer in die vrieskas. As die biltong geen vet bevat nie, kan dit vir ongeveer 18 maande bevries word. Biltong met vet aan kan vir 9 maande bevries word, waarna die vet galsterig word. Stadig: Plaas biltong met plastiekomhulsel oornag in die yskas. Laat dan vir ongeveer 1 uur buite en die biltong is gereed om te eet. Vinnig: Verwyder uit die verpakking en plaas vir ongeveer 1 minuut in die mikrogolfoond op die ontdooi-stelling of by 30% krag. Laat dan vir ongeveer 1 uur buite. Bevries in plastieksakkies of lugdigte plastiekhouers. Gebruik bevrore biltong in geregte. Op toebroodjies of sommer vir lekker eet – laat die biltong eers vir ‘n rukkie buite om warmer te word. Die biltong sal laf smaak indien dit te koud is. Bêre droë biltong so: Draai die biltong toe in vleisdoek of maak sakkies van gaasdoek of enige material wat kan asemhaal en bêre die biltong daarin op ‘n koel, droë plek met goeie lugsirkulasie. Dit sal vir meer as ‘n jaar hou, mits daar geen vet aan die biltong is nie. Die vet sal mettertyd galsterig word, maar die vleis sal niks oorkom nie.